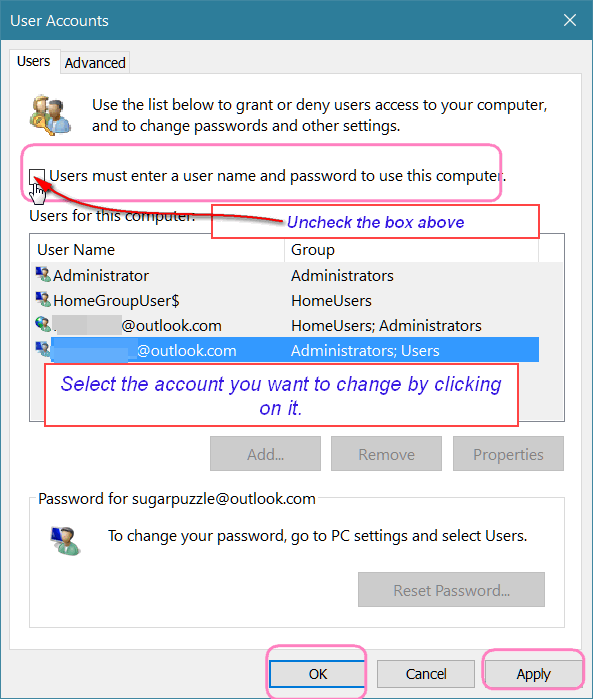 While we think everyone should us a password (or a PIN in Windows 8x and Windows 10), but we can understand why some people don’t want to bother with it, especially those who live alone or only have one user account on their computer and trust those who has access to it. 2. In the Run dialog type netplwiz and press Enter. 3. The User Accounts dialogue box will be displayed. 5. Uncheck “Users must a enter username and password to use this computer” press OK. You will be asked to type your password to verify. You’ll need to type your current password to confirm it. Then press Apply/OK. That’s all you need to do. Now reboot your computer — you won’t have to enter a password again unless you change this setting. Last week to get our Global Keys – good for ANY Cloudeight Direct Computer Care service. Keys never expire. They are good until you use them. This is the last week we will be offering Global Key. Get the details here.